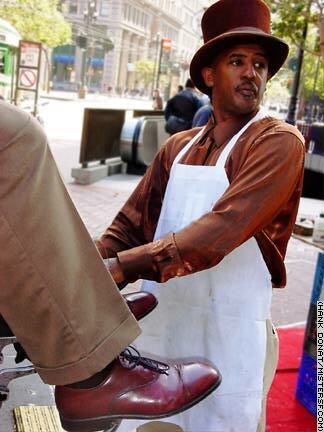 Oakland native Kenny "Famous Wayne" Bowens is simply the world's best shoe shiner. Just ask him. Wayne's plum location near the Hyatt Regency and the Embarcadero BART entrance at Market and Spear is only part of the reason he's so successful. Like Natalie Wood in Gypsy, Wayne figured out you've gotta get a gimmick if you want to get ahead. San Francisco's shoeshine king taps his innate charisma to land new customers and keep the faithful entertained for the few minutes it takes to transform a couple of dull loafers into a brilliantly burnished pair.